We are a group of management and financial accountants experienced in consultancy and public practice within the public and private sectors in the UK and internationally. We are...Read moreWe are a group of management and financial accountants experienced in consultancy and public practice within the public and private sectors in the UK and internationally. 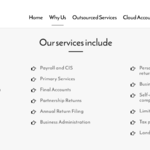 We are specialists in dealing with owner managed businesses and individuals’ personal tax affairs and strive to provide our clients with a personalised service while taking care of their finances and tax issues. We aim to build business relationships based on loyalty and trust and offer a higher level of technical expertise, service and value.